The Engineering & Scientific Association of Ireland is hosting the 2018 Dominick Tuite Memorial Lecture at Saint Laurence’s Church, DIT Grangegorman on Thursday, 22 February at 7.30pm. 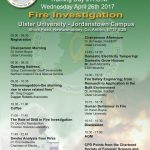 Liam Cotter BLC (Hons), MD, Liam Cotter & Associates will deliver this year’s lecture on the topic of “Forensic Vehicle Fire Investigation”. If you’re interested in attending, please email your RSVP to declan.allen@dit.ie.